Labour has kept control of councils across Merseyside. It easily retained Liverpool as well as Knowsley, St Helens, Sefton, and Wirral. 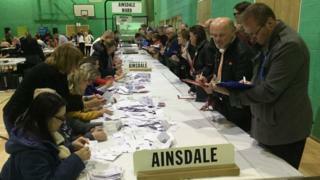 The Liberal Democrats gained three seats in Liverpool but lost four in Sefton, where the Conservatives picked up two. Labour also won comfortably in Halton in Cheshire, with the party holding on to all 17 of the seats it was defending. Carole Storey, wife of Liverpool's former Lib Dem council leader Mike Storey, was one of the newly elected councillors in the city. She beat cabinet member for housing, Frank Hont, in the Childwall ward. The now Lord Storey led the Lib Dems to power in the city in 1998 before it fell to Labour in 2010. Liverpool has been firmly red ever since. Mrs Storey said she was "elated" to join the council, adding that the city's residents were "dissatisfied with the building on green spaces, want their pot holes filled... and are sick of living in an environment that is not being cleaned regularly". Labour now has 76 of 90 seats in Liverpool, way ahead of the Lib Dems on seven. The Green Party had an encouraging night, though, and still has four councillors in the city. Across the Mersey, the Green Party kept their only seat in Wirral. Pat Cleary, who won in Birkenhead, promised to "keep working hard for the people he represents" and "hold the Labour Party to account for the way they run this council". It was a historic night for Labour in Southport, where the party made history by winning its first seats on Sefton Council. Council leader Ian Maher says the party's fight against austerity won them votes in the traditionally Lib Dem heartland. He said: "When you lose 51% of your budget it is hard to deliver. It is really good to see that most people don't notice... that's a tribute to the staff and colleagues giving us the support that we need." In Halton, where some thought the new Mersey Gateway bridge tolls would have an impact, Labour held on to all of its seats. Council leader Rob Polhill said: "Most of the people in Widnes and Runcorn travel free and the bridge has made a huge difference to their lives. It has brought in investment and has been very positive for us." Labour retained Knowsley but the Greens won their first seat on the council. Definitely no political earthquake here, rather some small tremors. Labour has kept control of all five councils in Merseyside. The results show that voters are happy to maintain the status quo where they live, with very few seats changing hands. Liverpool's Liberal Democrats have begun what they hope is the first step on the long road to regain their south Liverpool heartlands. They won three seats from Labour in suburban areas where green space protection has been a key issue. Labour in Southport will be celebrating the election of their first ever councillors in the town, which is traditionally Lib Dem territory. Their victory will certainly strengthen Labour's determination to win the town back from the Tories at the next general election. In St Helens, there was a win in Rainhill for an independent candidate who had stood against the council's local plan. No seats changed hands in Halton. But an independent candidate who campaigned against the Mersey Gateway bridge tolls came close to beating Labour in Hale. Nothing changed in Wirral, with both the Tories and Labour breathing a sigh of relief at not conceding any seats to the other side. Knowsley was held by Labour.